The Marshall Studio Classic SC20C is a switchable 5w / 20w tube amp combo that draws inspiration from one of their most iconic 80's am..
The Marshall Studio Classic SC20C is a switchable 5w / 20w tube amp combo that draws inspiration from one of their most iconic 80's amp designs ever - the Marshall JCM800 2203. The Marshall Studio Classic SC20C Combo brings a new level of affordability and portability to the legendary Marshall Lead series, which means you no longer need arms of steel and a hefty chequebook to get your hands on such glorious tube tone. With plenty of modern features under the hood such as a dual-input channel, power output switch, 3-band EQ, DI and several speaker load outputs, the SC20C is perfectly designed for the everyday recording process or the live gigging environment. The Combo version features a 10" Celestion V-Type driver which offers full-range, flat-response tone with bags of headroom when you start dialling up the gain. The Marshall Studio Classic delivers the tone and flexibility of an iconic JCM800 2203 in a more portable form. Giving those in the studio and playing intimate gigs access to that famous Marshall sound. Inspired by arguably one of the most successful guitar amps in Marshall’s history the JCM800 2203. The Studio Classic delivers the full spectrum of JCM800 2203 tone from rich and full cleans to heavier driven aggressive sounds in a portable format. It has a master volume, versatile EQ settings including presence control, a preamp volume control, an added effects loop and DI out. 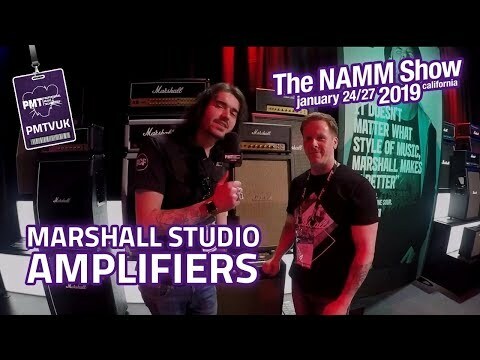 The original Marshall JCM800 was heavily endorsed and regularly used by some of the most iconic 80's guitarists and beyond, including Dave Mustaine, Eric Clapton, Kirk Hammett, Jeff Beck, Zakk Wylde plus many more. After explaining to the guys at PMT Birmingham that I was looking at getting a certain amp and that I was trying to recreate a classic rock, blues/rock sound they recommend that I give this amp a try and I couldn’t be happier that I took there advice. I have owned most amps fender has to offer plus a Mesa boogie dual recto verb I can honestly say hands down this amp has blown me away, I think it would be impossible to not get a great tone out of this amp amazingly even at very low bedrooms levels. The quality of sound, build quality and price tag for a British made amp will take some beating, the bar has been set. Thanks guys.